Sometimes, it is great to be immersed in the ancient world. When I look at each antique piece, I am always wondering what’s the story behind it? The people who carved the pieces, what do they look like and how did they feel when they were making them? A pink pleated vanity chair sets the tone for the functionality of the corner. A white-lacquered make-up desk with brass hardwares makes the space classy yet modern. 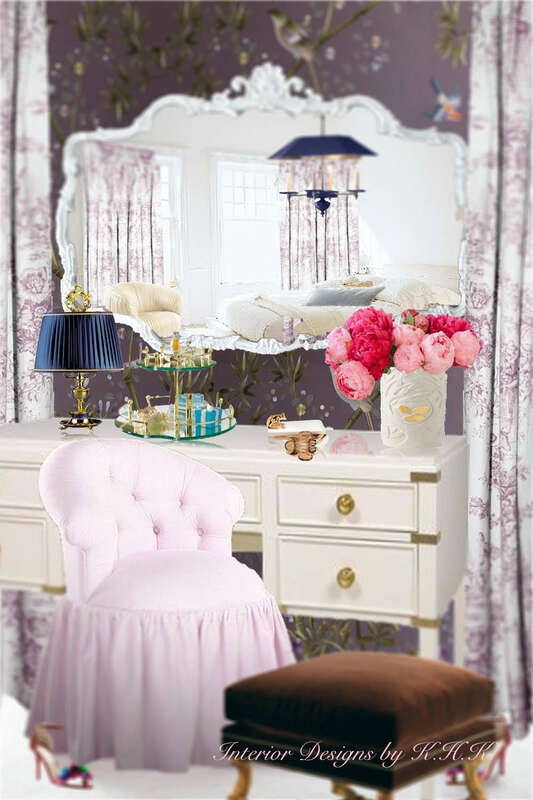 A whimsical lacquered mirror echoes the makeup desk and lights up the corner space. Lavender Chinoiserie wallpaper has a very feminine touch to the space. A two-tiered tray makes the desk very neat and organized. Pink and red peonies give a fresh and elegant touch. If you are planning doing something about your dressing room, I hope these 6 tips help. 1. Get rid of clutters. 4. Add some interesting color plush. If you are like me, try some berry, lavender and pink colors. For sure, this color palette can put you in the mood and make you focus immediately. 5. Have some interesting pieces like vintage table lamp, books, your collectible shoes , blue-white vases, chinoiserie items… These will express who you are. And you will enjoy your office even more. 6. Have cute and stylish furniture. Or mix and match different styles to make the room light and playful. This will stimulate your creativity. 7. Have a large piece of area rug to make your feet feel comfortable all the time. What is your office style? Please let me know your thoughts.